Have you tried our Aromatic Pipe Tobacco Sampler? Here's our pick of the top 5 aromatic blends from our offerings. Enjoy a one ounce package of each of Treasure Chest, Black Velvet, Cambridge, My Pleasure and Cherry Vanilla. 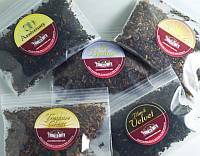 Choose the 5 Pack Aromatic Pipe Tobacco Sampler Pack to try our various custom blended pipe tobacco.